The tombstone bodes well for the day. Often when I'm climbing out of state with other Athenians, we meet folks who ask what the closest climbing to Athens is. Usually there's an uncertain pause, and then someone chuckle-scoffs out the words, "Shaking Rock." Then: "total chosspile." Shaking Rock is a little park in Lexington that is described on Mountain Project as "a lackluster boulderfield in size and quality." It's generally a last resort for folks aching to get their fingers on rock, any rock, and unable to make a day trip to Chatty or Lafayette. In fact, I'd never been before today because most of the climbers in my life would rather climb in the gym than at Shaking Rock. But today, my friend Caroline and I took an ill-advised trip there. We left at 6:27 this morning, hoping to beat some of the Georgia heat (and sleepy me forgot my camera). Our combined navigational deficiencies made the spot harder to find than necessary, but we still got a couple of hours in before the rays really started beating down. And it was so fun! We attempted the beginning of "Snake Eyes," a supposed V3 that threatened to rip through my sixth-day-raw tips and which requires a first move of such balance and fearlessness that we quickly moved onto the adjacent V2. This problem is a highball by our standards, and after a while of sketching ourselves out, Caroline sent it and we moved onto the tiny boulders, where we contrived silly climbs to practice our mantling, smearing, and beached-whale technique. By noon, our headshaking companions' worst fears were realized, and there was no longer any friction to be found on the hot, mayonnaisey holds. So we folded our crashpads and packed up our shoes, pleased with our outdoor session of non-epic, awkward, pure choss bouldering. PICTURES! (from my Instagram, because I'm lazy.) 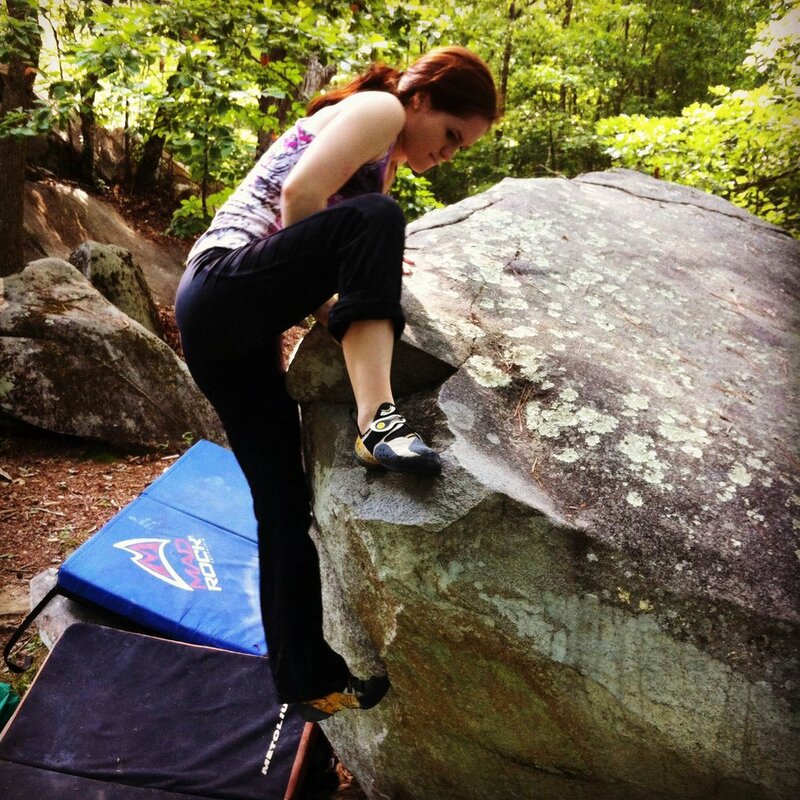 Caroline on our 4-foot epic proj. Trying not to just stand up. This slug was super majestic, but it was a nuisance trying not to squish him. Why do people do this? At least this one's more creative than "Denise G." I don't care about you and your uninspired handwriting, Denise G.!